I wanted to create a micro layout to showcase and operate some narrow gauge (HOe) machines and cars which I acquired during railway stock exchanges or bought new in shops [HOe = HO scale on 9mm gauge]. The subject of this new layout will be industrial, and I thought about building it in the space of two A4 [letter-sized] sheets put end to end (approximately 20 x 60 cms or 8×24 in). 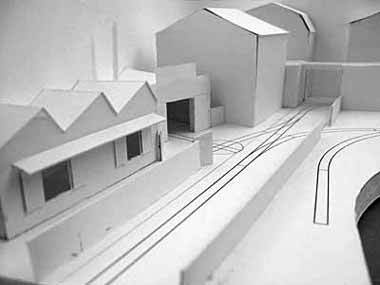 The initial idea was to implement a hidden backstage track with a sector plate to link with a visible front track with a short loop [balloon track] to allow traffic between the foreground and the background. To hide the backstage track, a normal gauge [standard gauge] railroad would be put on a heightened central roadbed, slightly in diagonal. However, I very fast realized that it was impossible to make this idea work; the track curvature radius would be too tight for linking in 20 cms width! Thus the switch changed direction, and traffic coming from backstage now requires a switch-back move to pass toward the foreground track and the sector plate. The design of the layout is now “L shaped” to accommodate a locomotive and several cars on the switch-back track. 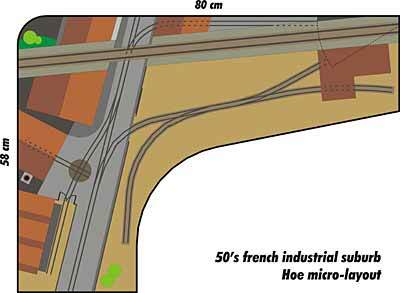 The layout’s subject becomes clearer: it will be a French urban and industrial suburb in the 1950’s with a paved street, some industries (to be defined) in foreground, and blocks of flats in background. First, the article “Atmosphère, atmosphère” from the French magazine Loco-Revue no 677 illustrated a normal-gauge line elevated above an industrial street (see sketch at left, adapted from Loco-Revue). Another source of inspiration was an old railway map of a district of the city of Saint-Etienne (at right). It’s the district where I work now. At the beginning of the 20th century, there were a lot of industries, warehouses, mine shafts etc., so a big yard (named “Voies de Bérard”) with many private tracks was created to serve them. I wanted to capture the feeling of an industrial setting like this one in Saint-Etienne, one of the first places in the world where railways were built. Next, a trackplan was drawn to scale, using standard computer drawing software (not specialized CAD). I simply used the dimensions of HOe PECO turnouts and tracks. The scale drawing showed that the dimensions of the initial idea (20 x 60 cms) would be widely exceeded: 55 cms in width x 75 cms in length [22×30 in]! However, the design remains within the limits of a “micro-layout”, because the branches of the “L” remain roughly 20 cms in width. Note that a turn-out track was added in the foreground to vary and multiply the possibilities of operation. 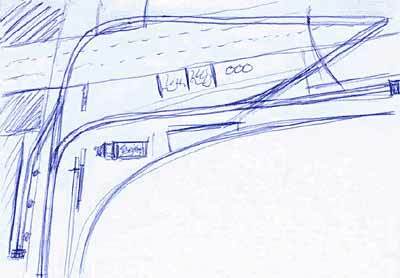 Various track dimensions have been adjusted to suit the rolling-stock, also drawn to scale on this plan. 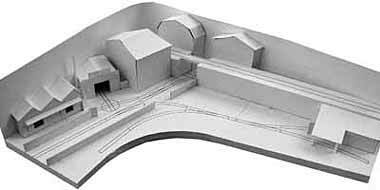 To validate the plan and decoration of the layout, I built a model in a scale 2.5 times smaller than the final layout. The overall result satisfies me, though a few more changes were indicated. For example, a small wagon turntable was added to serve one of the industrial buildings. This addition requires a width increase on the small branch of L to 25 cms, enabling the car to enter the shed. The layout thus now measures 80 cms in length by 58 cms in width [31×23 in]. The modifications which I added to the model are minor: the building served by the turntable will be placed obliquely, perpendicular to the track, and will have a stack on the side. To accentuate the perspective of the street, its two sides will not be exactly parallel but will tighten towards the rear. The curvature radius towards the backscene will be tighter so that the track enters the backstage exactly under the building. To give the illusion that the main track continues in the street, some rail sections will be placed in the continuation to give the impression of a switch. This completed my design work, and now construction has begun!